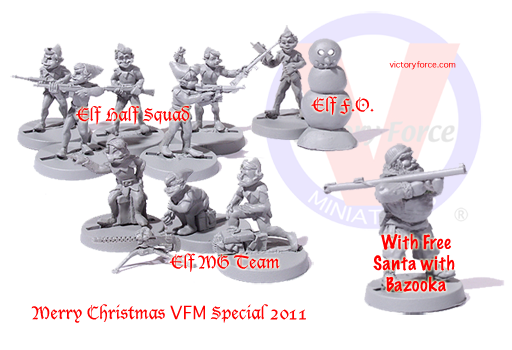 The VFM Christmas Elf Troop Special is here! Also get the tank killing, bunker busting Santa himself with a Bazooka FREE! Find the Special in Specials Section of the Victory Store as well as finding other Elf Troops in the Storybook Wars Section. Also available: Painted Elf Troop set. Allow 2-3 weeks for painted set. Save off the the price of purchasing the packs separately as well as getting the Santa figure free. Special not good with coupon codes and may end without notice. Excellent idea! On my wishlist.